Life’s TraVails is a classic DeFever 44 sundeck motor yacht with ample living space in an open and airy main salon with full galley on the same level. The full-beam master stateroom is aft with a walk-around queen-sized bed, an en suite head with shower, laundry room, sit-down vanity, and lots of hanging and drawer storage. The guest stateroom is forward with queen-sized V-berth and an en suite head with a wet-head shower. In addition to the full lower helm in the main salon, she has a full upper helm on the flybridge covered by a bimini that spans the full upper deck with roll-up windows. See the basic layout diagram here. However, her most appealing outdoor feature is the full-width covered aft sundeck with teak decking, table, chairs, and hand rails, comfortable lounge chairs, roll-down side sunscreens, ice maker, a gas grill, dock access both port and starboard, and swim-step access to the stern. The dingy deck stores an AB Navigo 10′ 6″ RIB dinghy with a St Croix euro steering wheel/helm and seating and provides cover for the sundeck. A Honda 4-stroke 20 HP outboard powers the dingy. Powered by twin Ford Leman 135 HP diesel engines with Borg Warner velvet drive transmissions, Life’s TraVails has Naid six-square-foot stabilizers, two Westerbeke generators, and three Cruisair reverse cycle AC/heat systems. For a more complete list of equipment, see the Equipment List. Life’s TraVails is an ocean-going yacht that is live-aboard ready. We completed the Great Loop in 2017, and under a prior owner, she did her first Great Loop, cruised the Bahamas, the Caribbean, and ventured as far south as Trinidad. 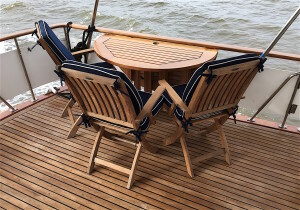 The aft sundeck is, at least for us, the key to the outdoor lifestyle we live on board Life’s TraVails. Spreading across the full beam of the boat, it is where we eat most of our meals and watch sunset (and an occasional sunrise). It is the perfect place to entertain, play games, or just read a good book. 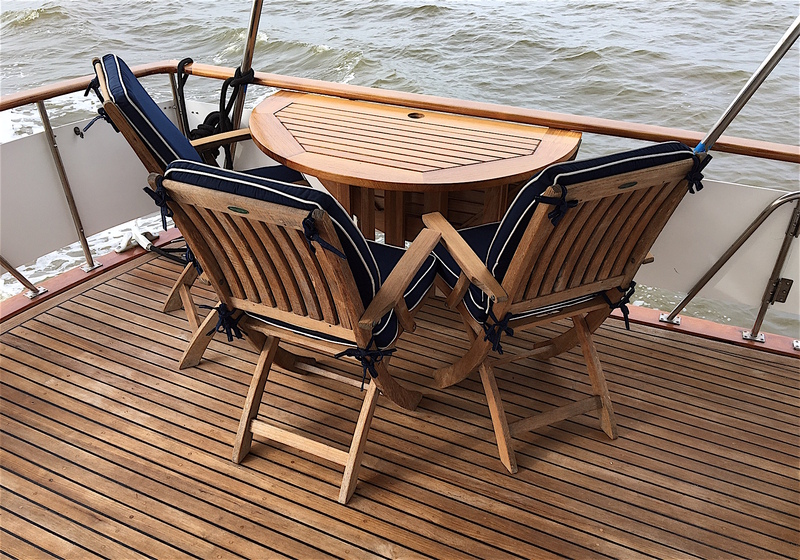 The sundeck is floored with teak and has a Winchester 4′ folding teak table and 4 teak folding armchairs with Sunbrella cushions, two deck lounge chairs and side table, Magma Newport gas grill, a pass-through window from the galley, and a U-line ice maker – everything you need. Roll down sunscreens provide shade from the late afternoon sun. Access to the teak swim platform is by way of an aft gate and ladder from the sundeck. The swim platform has a recessed transom shower system. A Marquipt boarding ladder may be mounted either starboard or port. See more photos of the aft sundeck. The large salon offers a comfortable, L-shaped settee and a inlaid teak table that comfortably dines six. To starboard is counter space with additional storage underneath plus two under-counter refrigerators. On starboard forward of the counter is a custom wall-hugger recliner loveseat. There is a foldable director chair at the lower helm. To forward port is a removable teak computer desk and a charging station for radios and other electronics. Aft of the computer desk is a wall-mounted HD 37″ flatscreen TV above the settee which has storage underneath), and two ottoman-type seats. 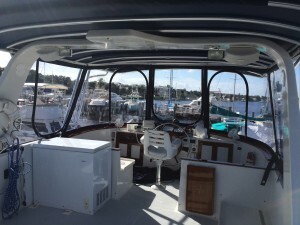 Mounted in the forward bulkhead is a Sony stereo receiver connected to Bose Acoustimass 3-speaker system in salon with Bose weatherproof speakers on flybridge. The sole is teak parquet. See more photos of the Main Salon. The galley is located to port on the aft end of the salon. Laminate countertops and a dual stainless steel sink make for easy cleanup and a sparkling appearance. An aft drop-down window provides pass-through assess to the sundeck while providing plenty of light and a nice breeze. The galley is equipped with a 3-burner Princess electric cooktop and oven, Magic Chef microwave, Black & Decker toaster oven mounted under the cabinet, under-cabinet lighting, and a full-height pantry. Under-counter space is used for storage and is accessed through a removable hatch as well as cabinet doors and drawers. Two Danby 2.6 cu. ft. under-counter refrigerators are mounted to starboard of the galley for easy access. 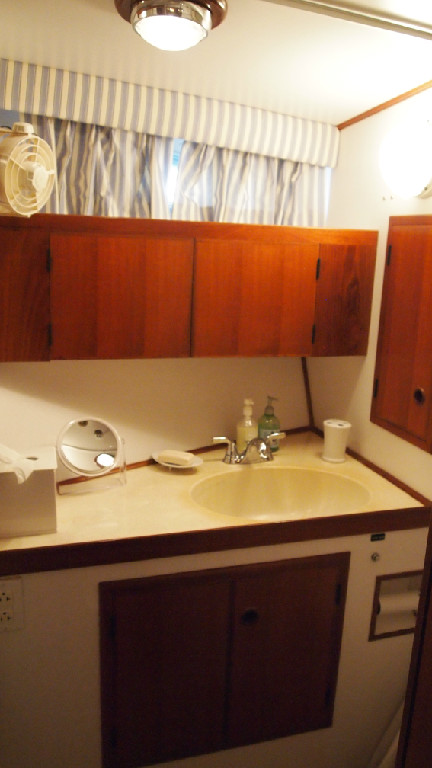 The galley is well equipped with dishes, silverware, glasses, mixing bowls, nonstick pot and pans, and utensils. See more photos of the Galley. The full-beam master stateroom is located aft for maximum privacy and has a queen-size centerline walk-around berth with a “wave” mirrored headboard to provide an inviting atmosphere. Six opening portlights and two large transom hatches, all screened, give lots of light and ventilation. The aft hatches also serve as emergency evacuation hatches. 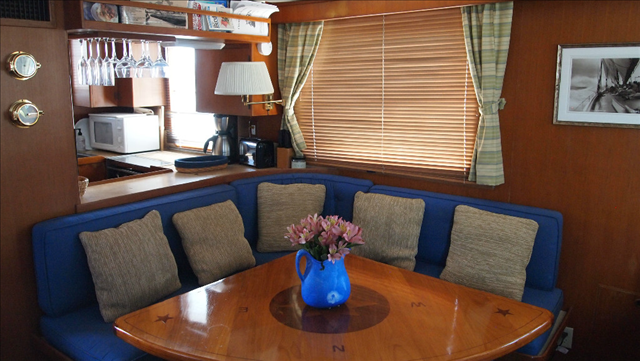 Reading lights and fans for each side of the berth together with overhead lights offer plenty of light and air. The master stateroom has teak parquet floors and plenty of hanging lockers and drawer space. A vanity to port with storable stool and sliding mirrored doors provides a comfortable space for makeup application and personal grooming. The entire stateroom is finished in Burmese golden teak. The en suite master head is forward of the master stateroom with a walk-in shower and a Raritan Crown electric head to port. Waste is processed with a Raritan Electro San Type 1 MSD. To starboard in the master stateroom is a laundry room with Splendide combo washer/dryer, storage for cleaning and other supplies. See more photos of the Master Stateroom. The guest stateroom is forward and down a short flight of steps, with an en suite head to starboard. The guest stateroom offers a V-berth, 4 opening port lights with screens, an overhead deck hatch with screen, and a fan on each side to provide plenty of natural light and ventilation. Each berth has a reading light plus a central overhead light. The sole is teak parquet and walls are golden Burmese teak. A hanging locker and several drawers as well as side storage over each berth provide plenty of stowage space. The en suite guest head offers an overhead rain-type shower, Raritan Crown electric head, opening port light with screen and teak medicine cabinet. 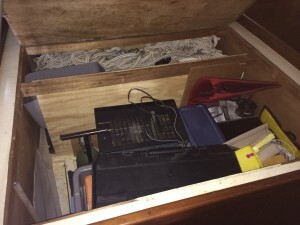 Additional storage space is found over and under the sink. Waste is processed by a Raritan Electro Scan Type 1 MSD and may be diverted overboard or sent to the 20 gallon holding tank, which is monitored by a Fireboy Holding Tank Monitoring System. See more photos of the Guest Stateroom. The flybridge is accessed by teak steps from the sundeck and is very spacious. A four-foot dockbox, which holds the propane bottle for the sundeck grill, provides storage and seating. There is also storage under the built-in seating and under the brow. A small foldup inlaid teak table provides a handy place for drinks and snacks. Forward bench seats (starboard and port) provide guest seating with a great view all around. 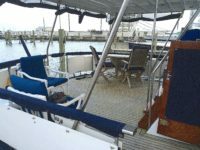 A full-length bimini includes a two-foot overhang in the front is mounted on a welded aluminum frame (new 2016) with O’Sea glass (improved Strataglass-like material) provides protection from the sun and rain. Front side windows zip from the top to allow opening even in the rain. A full forward helm has a complete electronics package, communications, and engine controls. A comfortable Pompanette helm seat provides the captain with full visibility in all directions. Outdoor speakers mounted on the radar arch pipe music from the entertainment system in the salon. 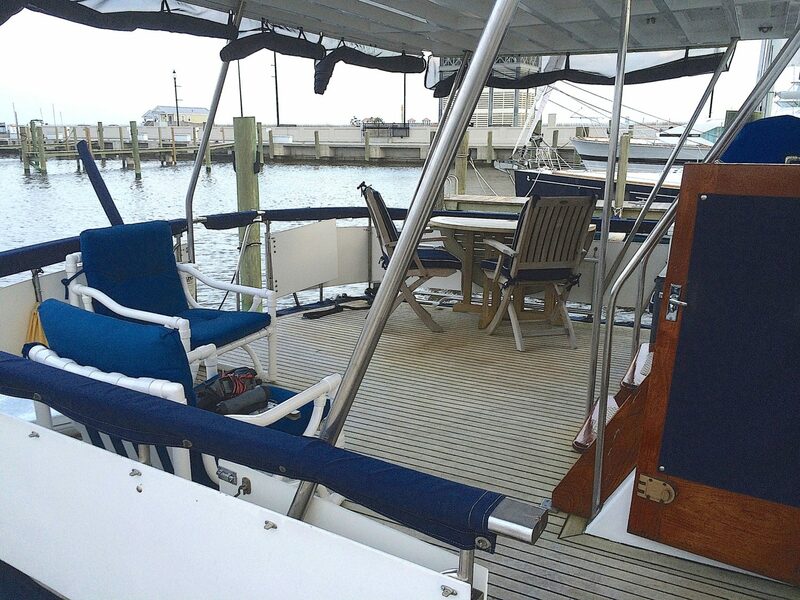 Two deck chairs with cushions provide additional flybridge seating. The flybridge also houses the freezer and provides access to the bicycles, dinghy deck, and scooter. See more photos of the Flybridge. Life’s TraVails’ engine room is accessed through a soundproof door in the guest stateroom. The engine room has 5′ 6″ headroom and accommodates the two Ford Lehman SP 135 HP diesel engines with plenty of access for maintenance. 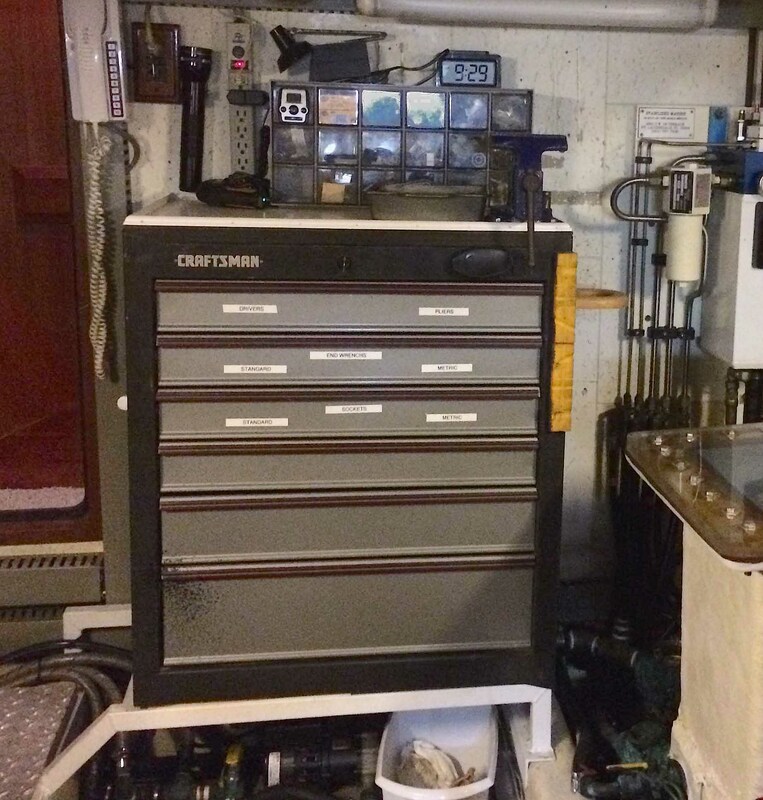 A wall-mounted 6-drawer Craftsman tool box, work surface, and a vise provide both storage space and work space. The sea chest accommodates all through-hull intakes and has been extended by three inches to allow for safe in-water access. Two Westerbeke generators (12.5 KW & 8 KW) provide AC power at anchor or underway, as does the Freedom 2500 watt inverter/charger. Each engine has a separate starter battery as does each generator. The house bank is outboard of each engine in fully enclosed battery boxes, with four 6-volt deep-cycle golf cart batteries per side (new in 2016). Additional equipment includes an ESI fuel polishing system, dual Reverso 3 valve oil change system, Halon fire suppression system with engine shutdown, dual Racor 500 fuel filters for each engine and a single Racor 500 fuel filter for each generator, plus an inline raw water filter. See photos of the engine room, and the Equipment List for a more complete list of equipment. Life’s TraVails come with a complete complement of tools. From maintaining the woodwork (electric sanders, saws, drills, etc.) to rebuilding an engine (sockets, drivers, end wrenches, torque wrench, electronic tach, etc. ), most every tool needed for any repair is already on board. 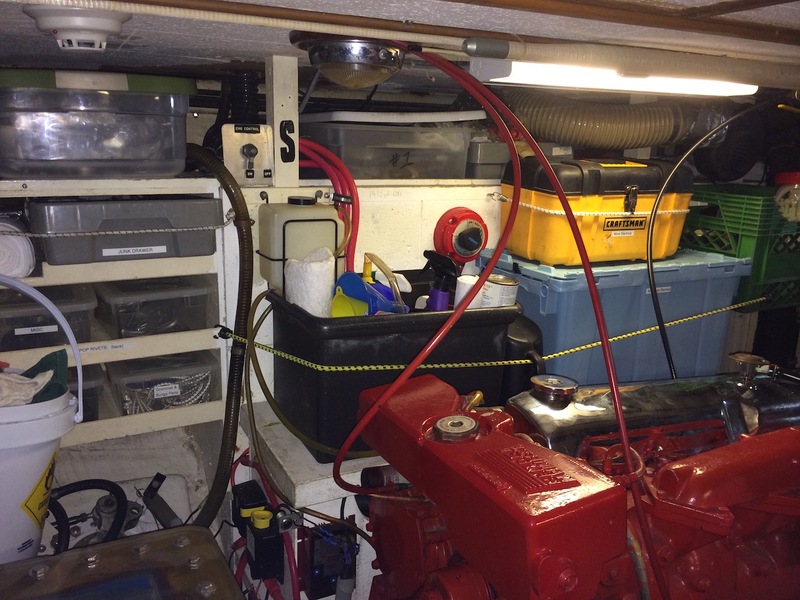 Along with the tools is a supply of spare fasteners (SS nuts, bolts, and screws), spare engine parts (water pump, fuel pump, alternator, heat exchangers, V-belts, and impellers), electrical parts (solenoids, switches, wire crimp fittings, circuit breakers, and battery charger), as well as spares for the dingy and Honda engine, Rartan heads, Groco strainers. Most spares are inventoried in an Excel file, which includes not only spares, but other supplies as well. Click on this link to download a sample of the Inventory Excel file. 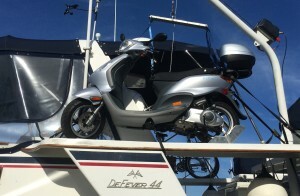 One of the best things on the boat is only used off the boat – a 150CC Piaggio Fly scooter, which mounts on the wing of the port dinghy deck. 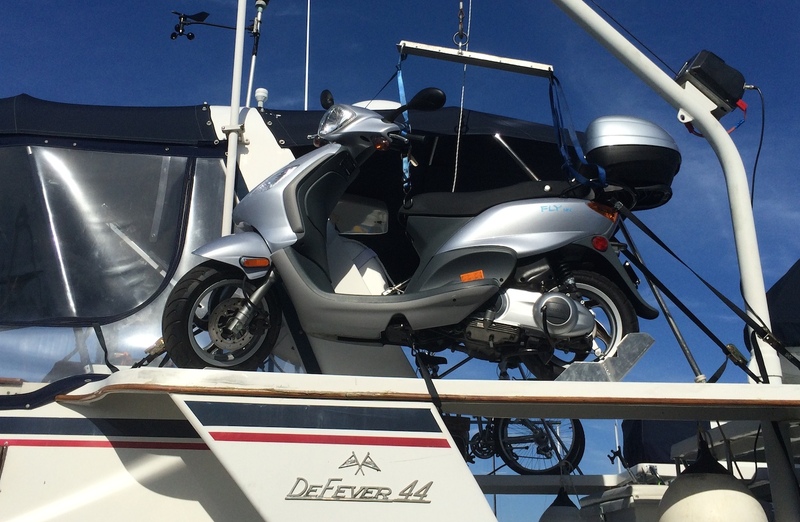 Raised and lowered with the electric winch on the dinghy davit, from start to finish it can be on the dock in 15 minutes, ready to take you to the grocery store or sightseeing. With matching full-face helmets, this little scooter gives tandem riders the freedom to see the sights without the hassle of renting a car. See more photos of the scooter. Originally configured with a fuel tank under the queen master bed, the tank was removed and converted to storage. Divided in two sections, the aft section holds an extensive supply of storm lines (many brand new), and two of the 3 spare anchors. The forward section holds a full set of charts and guidebooks for the Great Loop along with additional supplies like oil and fuel filters and some seldom-used specialty tools. Even after the tank removal, she still holds 650 gal of fuel. See more about the tank removal click here. Did you let the house batteries get too low? 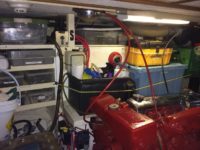 No worry – both engines and generators have dedicated batteries, but they can be combined with the house bank with the turn of a switch. At home and want to know the battery levels on the boat, or the temperature, or get a Google map of its location. The Siren Marine remote monitoring system will give you all that plus. Or program it to send you a daily report. Do you and your first mate have difficulty communicating between the foredeck and the flybridge, especially while anchoring in the wind and rain? Problem solved with two sets of “marriage saver” wireless headsets. Time to change the oil? Just flip a switch and let the Reverso oil change system pump the oil right out of the engine (and transmission and generator). Flip the switch the other way, and pump fresh oil back in. Does your boat list to one side or the other due to fuel and water usage changes? On Life’s TraVails, simply turn a small valve or 2 to allow transfer of water from one tank to the other to rebalance. See water balancing manifold. Got a bit of dirt in the fuel supply? No problem; just turn the lever to the other side of the duel Racor 500FG fuel filters and isolate the dirty filter while you continue on. Want to wash down the deck, but not use up your valuable fresh water? Just hook up the hose to the saltwater washdown pump on the bow and wash away (also useful for cleaning the anchor rode during retrieval). Some yahoo cut you off when you clearly had the right-of-way? Just hit the Kahlenberg dual chrome marine air horn and you’ll sound like a tanker (extremely useful in fog as well). Not enough storage space on your boat?. 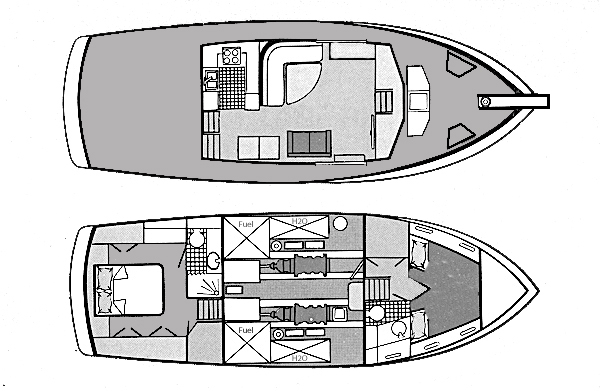 Life’s TraVails, with storage under the main stateroom bed and the addition of dockboxes on the bow and dinghy deck, has more storage than any DeFever 44 we know.